Yamaha 200W/Wirelss Sub DTS/Dolby/BTExperience TV with sound that will keep you on the edge of your seat. 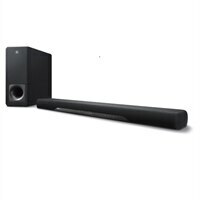 This low-profile sound bar fits discreetly in front of your TV and can even be wall-mounted. Setup is a breeze with a single cable to your TV while Bluetooth® means you can wirelessly stream your favourite music from mobile.